All Year 6 pupils have the opportunity to take part in an overnight residential in the summer term. For a lot of our pupils this is the first time they will have been away overnight without their families, therefore we only travel a short distance to Thirtover Place in Cold Ash and we stay just for one night. The pupils stay in a lovely house, sleeping with their friends in dormitory bedrooms. In the grounds is a small adventure playground and we take part in some fun activities that are fully supervised such as grass sledging, archery, low ropes and singing around the campfire. The evening meal and breakfast is provided and where appropriate, pupils make their own packed lunch. We invite all parents to a residential meeting the week before we depart so that we can talk through individual pupil needs such as diets and medication. All the pupils really engage with and enjoy the residential and it prepares them for longer residential trips when they move into our Secondary School. One for Key Stage 4 students only, this one-night visit takes place at the beginning of the school year in order to promote socialisation and team-building within classes. It is also a great opportunity for staff working with young people in Key Stage 4 to develop trusting relationships with our students, setting us up for a great year of working together. Thirtover Place provides shared room accommodation for our students, with activities organised by Key Stage 4 with a focus on small group team building and communication. Last year’s activities included treasure mapping, creation of environmental art, cooking on trangias and camping stoves, grass sledging and a large bonfire with marshmallows and hot chocolate to top it all off. This trip is aimed at our young people with severe learning difficulties, with the trip taking an overall feel of a relaxed holiday. The focus is on developing independent routines for self-care, ownership of own belongings, preparation for specific activities and self-occupation. 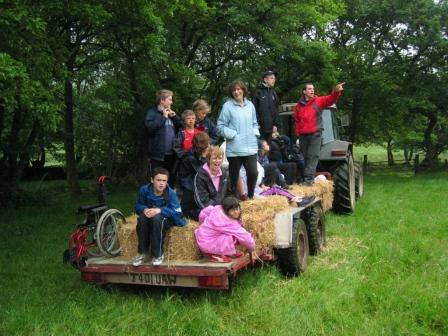 The trip is a great opportunity for our young people to socialise with each other as the farm offers shared rooms and living spaces, and we often find new friendships and interactions are formed while we are away that we may not see in school. The farm itself is located in the Welsh countryside, with an onsite indoor swimming pool, social and dining room, rooms with maximum 6 beds with en-suite bathrooms in each and surrounded by forests and farmland which we take frequent use of during the week. Food is provided by the centre and our young people get 3 square meals a day plus snacks, and it is a lovely opportunity to all get together to eat and social together in the dining room. 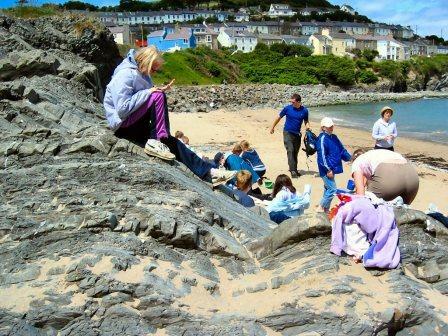 We bring our school minibuses with us so we can visit different locations in the surrounding area, such as a beach day in the small town of New Quay with fish and chips and some dolphin-spotting, and a trip to Aberystwyth Mountain Railway on an old steam train. This trip is aimed at our young people with moderate learning difficulties, and while the focus is still on gaining independence and confidence in staying away from home there is also more of an element of challenge to this trip, with them aim to get our young people out of their comfort zones and try things they have never had the opportunity to do before. The site is run by Kingswood, a residential provider with a very good record and various sites across the country. Our young people will share rooms in small numbers, each with en-suite facilities. Food is provided from the centre’s restaurant with 3 meals a day and different options available to suit different needs and tastes. Activities on offer range from rock wall climbing, aerial pursuits and high ropes courses, lazer quest, an indoor swimming pool, cinema room, nightly social events and discos, archery, sports and even a ‘people’s course’ where groups can sort out their disputes in a courtroom setting! We travel to Kent by hired coach, leaving on a Monday morning and leaving Grosvenor Hall at Friday lunchtime in order to return to school in time for buses home.